In stock -This product will ship today if ordered within the next 4 hours and 4 minutes. 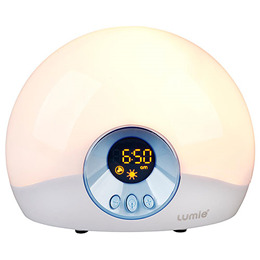 The Lumie Bodyclock Starter is a sunrise alarm clock that imitates a sunrise effect beside your bed - from the first faint glimmer of dawn, gradually increasing in brightness until you gently wake up the way nature intended; fresh and alert with your body clock perfectly synchronised. Since time began, humans have learned to respond to the rising dawn by slowly waking up. Today, however, we tend to startle ourselves awake with an abrupt alarm call that can leave us feeling weary and irritable all day. Fortunately, with these ingenious gradual sunrise alarm clocks, we can return to the natural way of waking up. 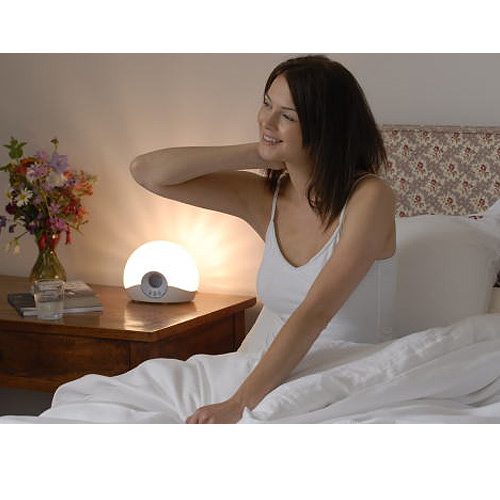 The brightening light is a natural cue for your body to reduce the production of sleep hormones (e.g. melatonin) while gradually increasing the levels of hormones that help you get up and go (e.g. cortisol). Waking with the light every day will help to keep your sleep/wake cycle on track and has shown to boost your mood, productivity and energy levels for the rest of the day. Power failure backup: Your Bodyclock Starter keeps time for one hour; other settings are permanent, so you won’t need to reprogram the unit, just plug it back in. 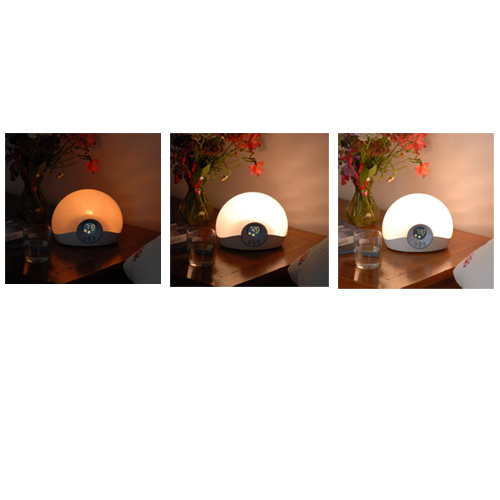 For replacement bulbs visit the Light Therapy Accessories Category here. Please Note: This model replaces the Lumie Bodyclock Sunray and the Lumie Bodyclock Starter 25 Sunrise Alarm Clocks. 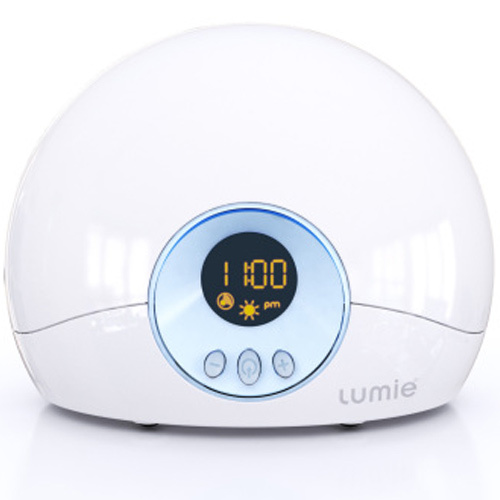 Below are reviews of Lumie Bodyclock Starter - Sunrise Alarm Clock by bodykind customers. If you have tried this product we'd love to hear what you think so please leave a review. Seems to be working so far, two weeks in. The light is lovely and bright however the buttons are rather 'clunky' for the price you pay and the alarm noise is a horrible buzzer so wakes you with a shock. Would recommend. Good delivery and well packaged. This is an excellent clock / bed light. Would highly recommend to anyone. Price is the cheapest i could find anywhere.Delivery was very prompt. I'm a heavy sleeper so I've been pleasantly surprised at how effective the light alarm is. I still use the sound alarm just in case. Can't give it 5 stars as the user guide and settings can be confusing - easy to mis-set accidentally, not intuitive. I love this clock. Really makes a difference to how relaxed I am when going to sleep and how easy the wake up is. Sometimes a bit of a pain setting/re setting but generally good. Everyone should try it. Much better than waking up with palpitations and/or having emfs from a phone alarm. Love it. Being woken gradually by the light is a very natural way to wake. Very useful both as a gentle wake-up and effective bedside light. I do still need to use my radio alarm clock but with the graduated light it feels a more pleasant start to the day and with black-out bedroom curtains I guess I'll still be using it in the summer months! Simple to operate, does everything I was looking for and I feel like it's having a positive effect. If you're happy with a dawn simulator which does the basics, then no need to shell out for anything more expensive than this. It does get quite hot, probably not dangerously so but it might be wise to exercise caution if using this with children. This is a replacement for my old one as the alarm has stopped working. Saying that it has lasted years but personally the light isn't enough to wake me by itself. I have been using this clock for two weeks now. The light gently wakes you up and getting out of bed is less of a mental struggle for me now. A fantastic alarm clock, makes such a difference on a dark winters morning. I love my Bodyclock Starter - it has made a real difference to the mood I wake up in! top class - the Bodyclock starter 30 has worked wonders for me, i wake up happy and refreshed (finally). The one gripe is lack of radio but really for what it does having a separate radio is not a major issue. The Lumie Bodyclock Starter is a sunrise alarm clock that imitates a sunrise effect beside your bed until you gently wake up. Perfectly synchronising your internal bodyclock, a dawn simulator is a must-have for dark mornings.